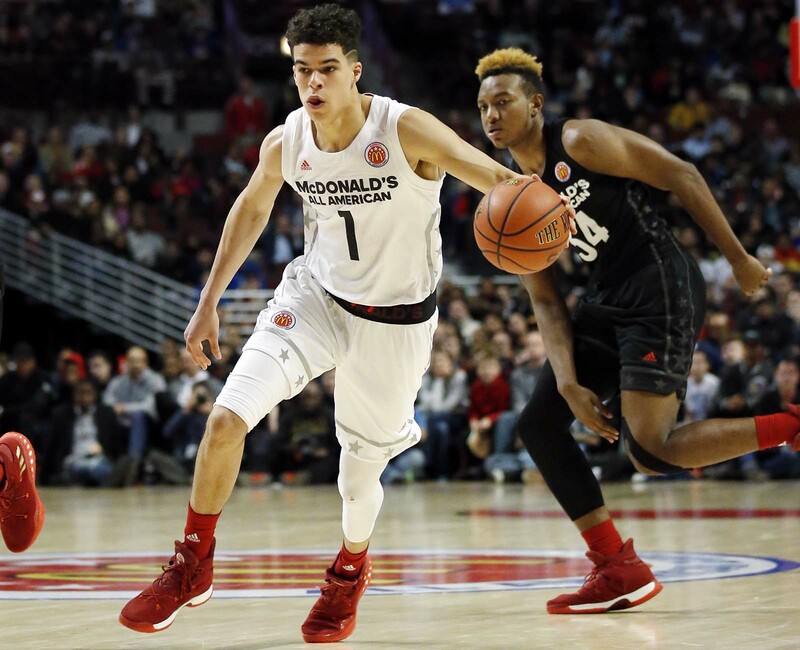 Any 6'10" prospect with a perimeter game faces Kevin Durant comparisons, but Michael Porter Jr. might be the real thing. What do NBA scouts want to see from the big man at Mizzou? There’s a unicorn–sized trap that the public sets for any 6’10” teenager with a perimeter game. We saw it with Brandon Ingram a year ago. This dubious set of standards will inevitably be foisted onto Michael Porter Jr., who is highly likely to be one of the first two or three players selected in the 2018 NBA draft. By any measure, Porter is a top-ranked prospect and doesn’t really need a ton of introduction. As such, neither do columns about him. For the unindoctrinated, the skinny: Porter was born and raised in Columbia, Mo., where he rose to prep stardom and was a fixture at the highest levels of the high school circuit. He was whisked to Seattle for his senior year after his father took an assistant job at Washington, where Porter committed. After Lorenzo Romar’s firing, Mizzou's Cuonzo Martin hired Porter Sr. and laid the groundwork to turn around a dormant program, the fate of which now lies with the Porter family. For what it’s worth, Porter Jr. is not SI.com’s No. 1 rated prospect at the moment (that title belongs to Marvin Bagley III; it’s still not even September). Missouri has birthed some talent over the years—Bradley Beal, Otto Porter (no relation), David Lee—none stayed home. Porter Jr. returning to Mizzou is already quite possibly the best thing to happen to in-state hoops since the St. Louis Spirits were around in the 70s. The circumstance coupled with the talent multiplied by the sheer amount of time Porter has been on the radar means he’ll enter college as the most-hyped member of the freshman class. No matter what happens, Kevin Durant comps will be tough to validate—they weren’t fair to Ingram and they won’t be fair to anyone. Martin called Porter a blend "of Kevin Durant and Kevin Garnett." Bless his heart. It’s easy to forget just how dominant Durant was in his one year with a very good Texas team, and that Durant is actually 7’0” and that the best basketball players tend to be singular. But on a more rational level, scouts are intrigued by Porter’s blend of size and skill, a combination that as a rule of thumb can offer a reliable floor for a young player’s career. When you hear about wingspan and standing reach, it’s not just about shot blocking or defensive potential—oversized guards and wings get second and third chances. It’s not rocket science: in a tall man’s game, the taller and more skilled you are, the easier life is going to be. It’s why D.J. Wilson can go from unknown to 17th overall in six months, why a teenage Harry Giles is still a first-rounder despite serious knee issues, and why Jonah Bolden can wash out at UCLA, play well in a mid-tier league in Europe and come back to get drafted ahead of several dozen guys who had real college careers. Apply that principle to Porter, who just turned 19 and has proven to be a skilled ball-handler and shooter at 6’10”—effectively suited for the three, built like a five—and you’ve got an elite prospect. His ability to face up, handle, make tough jumpers and use his height is rare, and will enable him to score plenty at Missouri. He appears to be the top talent in that mold going into next year, which is really all that matters. That said, when kids have been under the microscope for as long as Porter has, there’s a tendency amongst scouts and media alike to pick them apart, perhaps unfairly. Most people in the business will admit this if you ask them. It’s easier to find a new way to challenge the consensus opinion than it is to find new ways to rehash tired praise, even if it’s warranted. It’s crucial to see the context. “It’s almost to the point where I wouldn’t even tag him with a position,” a second NBA scout says of Porter’s skill set, offering a reminder that so many things are still, for lack of a better phrasing, TBD. Although it may not matter much in terms of draft position (which is relative), Porter will still be tasked with shaping how he’s perceived. Even in an NBA where skilled players tend to slide down a position on offense, who you can legitimately guard ultimately sets a ceiling for playing time. Because of his size and high center of gravity, how well Porter defends the perimeter will effectively determine whether he’s a three or a four. That will determine what weaknesses matter, and also in what ways his unique strengths translate. Is he a true three, or is he a face-up four? Can he corral his shot selection and add a playmaking dimension to his game this season, or will he put up huge numbers on a struggling team? If he’s a four, will he be committed to playing in the paint at the highest level?